It takes some time before the tightly knit circular human fence dissolves. The person who emerges from there is none other than the popular writer Mohammad Zafar Iqbal. "I love it when kids, young boys and girls hold out their books and notebooks for my autograph," he confesses. And those who have managed to get the autograph, beam with joy as they show their prized possession to their awaiting parents. 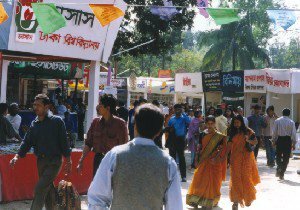 In Ekushey Boi Mela books are not the sole attraction. There is always the chance of meeting your favourite writer. The characteristic soft scent from the new born books that wafts along on the pleasant February wind welcomes the bookworms. Bookworms of all ages-- the school going, precocious bookworms with their heavy weight glasses and the grey haired veteran bookworms -- assemble here to feast their eyes and minds on the wide collection of books on offer. Since almost all the notable publishing houses take part in this month-long book fair it provides the bookworms with a unique opportunity to check out the new releases. 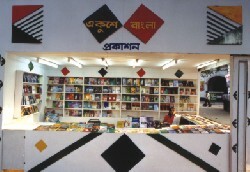 "Ekushey Boi Mela is the only place where you find any book (that is published from Bangladesh) you want. Except for a few very popular writers you won't find many of them in the libraries, so the only option is to come to the fair and get my entire year's stock from here," Iqbal says. Ekram Hossain, a Masters student at Karmichael University in Rangpur cannot agree more. He exhibits his pick, Tenida Somogro by Tarasangkor. But among the hundreds that pour into the Bangla Academy premises every afternoon not many are serious readers. Ekushey Boi mela is not all about books. Books may be the occasion but not the only attraction for a large number of visitors who throng in their hundreds, sometimes with family members, sometimes all alone and most of the time with friends. For the entertainment starved Dhakaits who have little to do and almost nowhere to go, even the dusty Academy premises appears a good hang out place or a good adda venue. The other essential requirement for the fair to qualify as a good hang out place is also there in the form of a large contingent of Chotpoti stalls standing in a row closely accompanied by icecream vendors, muri bhaja, badam, ghugni and so on. After filling in the small open space the gathering crowd spill out into the adjoining street. A number of groups of different size and shape are scattered all over, some absorbed in adda while some just look around aimlessly, some are strolling through the zigzag lane in between rows of book stalls, some have chosen to sit idle on the bricked (pacca) spacious fence that surrounds the aged sprawling bunyan tree. While muri and chanachur, accompanied by tomatoes proved to be the greatest crowdpuller along with icecream--particularly among children and womenfolk, the loud call, "coffee, hot coffee" from the coffee vendor hasn't failed altogether. The young visitors who come in large numbers, infect the air with their enthusiasm; their infinite energy to make the mela premises buzz with life. This feeling of joviality is what gives the Ekushey Boi Mela its distinct character. Children are also part of the crowd that throngs in the mela premises every afternoon. Noted publisher Sahittya Prokash has become the main attraction for the young readers. The world renowned Walt Disney series books for children, are now available in Bangla translation, courtesy of Sahittya Prokash. "Our sales of children's books is often higher than other books," Kamal Hossain, the man in charge of the stall, reveals. Cindarella, Ghumkumari Part-1, 2, 3, Sonali Mach Dhorar Golpo are among the best sellers of the Walt Disney collection. Another stall called World of Children's Books, perhaps the only stall devoted exclusively for children, has caught the imagination of the children. "Our books, meant for children of 3 to 10, would serve the dual purpose of giving pleasure and education," says Mustafa Panna, a writer and associate of the publishing house. The titles like Boloto Ami Ke or Boloto Ki Dekhcho, Baba O Ami testify Panna's claim. The careful choice of the topics written in a way so that children can identify with them easily. The beautiful and simple illustration certainly deserves kudos. As always, at least for the last two decades, Humayun Ahmed's books are topping the best sellers list by a big margin. Two of his new books -- Jodio sondha and Jononi O Jotsnayar Golpo -- both published by Annoprokash have so far hit the stalls. Only six days more than 12 thousand copies of Jodio Sandhya has been sold. Jononi O Jotsnayar Golpo, the largest novel Humayun Ahmed has ever written was scheduled to arrive on February 15. Based on the independent struggle the novel has already created great enthusiasm in the literary circle, not to mention the die hard Humayun fans. Another big name in the mela premises is Zafar Iqbal. "I have a total of seven and half new books for this fair. I am not sure but if giving autographs is any indication the science fiction Obonil seems to be selling well," Iqbal says.